My credit card is expiring 2/19 and am trying to do Billing Update using the renewed one. Its numbers are same but has new expiration date and CVV code. I keep getting 'Error occurred. Please try again' when I click 'Save' after putting all the information. Yes, I'm doing it in PC(Win7Pro) + Chrome(latest). I also did it in incognito mode and cleared cookies and data but still getting 'An error occurred. 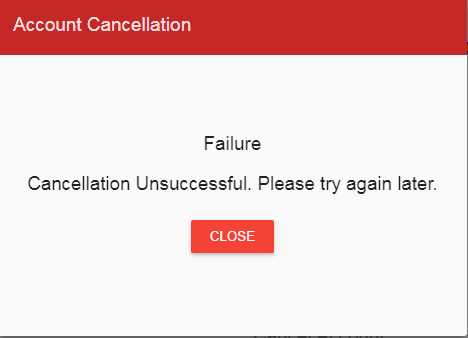 Please try again'. Here is the screenshot. The message disappears in about 3 seconds. I took it before it is gone. Is someone looking into this? Please let me update my credit card info!! Yes, I was able to use another card and I see it is holding $20 on the card. No, I have used another CC. I have 5 lines on that account and I see all 5 are updated with the same billing info. I'm ok with that. 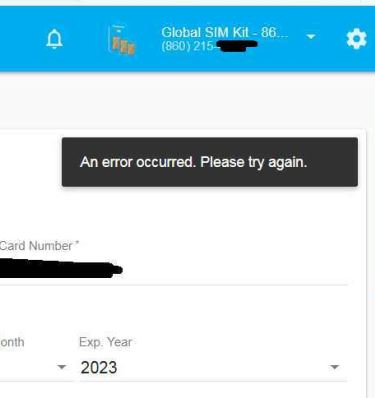 The 2 of 5 are old global SIM and I'm trying to remove them but I keep getting errors. Can you help me with that? I meant I see $20 held on my CC. I can not cancel the Global SIM lines. It is giving the following error.